Have you ever left work or home and then had the feeling you had left something important undone? That uneasy feeling followed Kate McCallister onto a Paris-bound airplane in the holiday classic Home Alone. The busy mother of five hadn’t left a task undone; she’d forgotten her youngest child, Kevin, who had been banished to the third floor of the house the previous evening, as punishment for misbehaving. By the way, the whole story line of that movie, released in 1990, would have been impossible to swallow if mobile phones had been as commonplace as they are now. Text Mom, “Where are you guys?” Kate cries, “Peter!! We forgot Kevin!” Send a cab; change an airline reservation; meet up in Paris; apologize; hug; say “Merry Christmas.” End of story. Back up even further and rewrite, having Kate make a little reminder in her mobile device: “Remember Kevin.” Reminders on our personal devices and our desktop computers are wonderful things. Dash off a few keystrokes (or give Siri a voice command) when a future task or appointment is on your mind, create an alert with a reasonable lead time, and you’re all set. All set, that is, if you pay proper attention to your reminders once they’re out there. But we have all been there, right? Snooze. Snooze. Snooze. Snooze. Dismiss. The next afternoon, at the Auburn-Georgia football game in Jordan-Hare Stadium, my daughter and I found the field activity unfixating enough for us to trek down to the concession stand for a snack. Our intended quarry was popcorn or nachos, or both, and Dr. Pepper. (Yeah! Carbs, salt, fat, sugar, and caffeine. Just what stadium food ought to be for the health-conscious sports fan.) However, while we were descending 21 rows of concrete steps from the upper deck to concourse level, I had seen a child holding a plate of funnel cake. (Yeah! Carbs, fat, and sugar. Just what stadium food ought to be for the health-conscious sports fan.) And, as it just so happened that the tail end of the long line for the main concession windows placed us right in front of a separate vendor making funnel cakes, Dawn and I began a discussion of the pros and cons. There was no line at all for funnel cake. The beverage choice there was not a choice. It was bottled water, a healthier option than what we had been thinking. One funnel cake and two bottles of water would cost less than the other stuff at the other place. Funnel cake smelled really good, and we could see that the cakes were being made to order, not pulled out of a warmer. We hadn’t had a funnel cake in a long time. Virtually all of the “pros” were landing on the funnel cake’s side of the page. We made our move. On the counter space of the small booth rested a large, rectangular, metal pan holding the powdered sugar to be sifted over the top of each deep-fried delight. Dawn and I were thinking, “Please sift generously!” – a sentiment we reconsidered shortly thereafter, when the wind began blowing the white stuff off the cake and onto our navy blue attire! You just never know what excitement a Game Day has in store for you. As my gaze rested on that pan of powdered sugar, a light clicked on in my brain. Try to understand the absolute similarity of what I was seeing to the subject of an undone Friday work task I suddenly remembered – items I was to have procured for a teacher of children’s Sunday school to use in an object lesson on Sunday morning. The Bible story was about Daniel and the hand that wrote on the wall before King Belshazzar and the teacher planned to use some large, rectangular, metal pans from the church kitchen, each holding white flour. The children would be invited to write on the surface of the flour with their fingers. Oh, yes; the task of placing those pans in a certain classroom was on my printed list. I just failed to go over my list one last time before leaving work. The title of today’s post is crystal clear now. Don’t even try to persuade me that my Lord didn’t lead me to that very spot to see that very sight, so I would have the opportunity to remember and to contact someone* in Birmingham who could secure the requested pans, covering the assignment I’d let slip through the cracks on a Friday afternoon whose special events had thrown me off my usual routine. P.S. 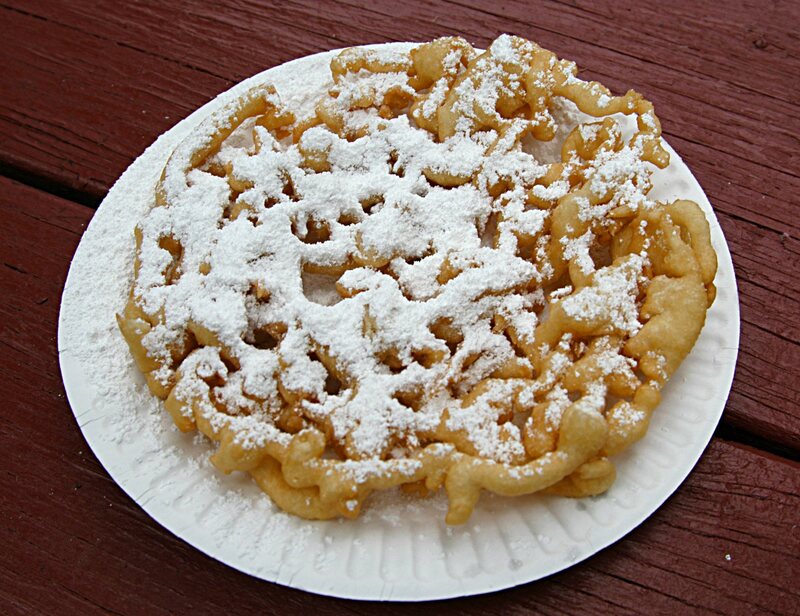 The funnel cake was yummy! Grace upon grace. On October 16 I drove past some Hispanic children who were waiting for their school bus. (Travel with me now through Betsy’s train of thought.) Knowing that some of our Hispanic neighbors are Catholic, and remembering one front yard that is decorated elaborately every year with a rough stable structure, outlined in bright lights and sheltering figures of the Holy Family, I got from school bus to Christmas in matter of seconds. A recurring prayer came to mind then, one I have expressed internally more than once. Many of you have had the same wish: for “this Christmas to be different” – more special, more memorable, unique. Not “the same old thing.” Not “going through the motions” without any of it touching or delighting us in the way we recall dimly from childhood, or in the way that those little, red, square, hardcover books on the checkout counters at gift stores tell us someone else was touched by a special Christmas moment. And then it hit me. Maybe it’s what is the same about Christmas every year that deserves our notice. 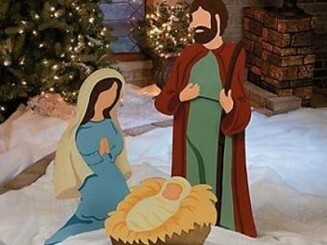 Christmas is always the story about the Christ child. It is always the story of how shepherds and angels came to worship and to announce the holy birth. It is always a celebration. It is always about giving gifts because our hearts are full. My children are in their twenties now and still live nearby. I have observed Christmas changing for them, holding less of the exhilarating mystique it used to hold, with the going to Grandmother’s house for an amazing dinner and the discovery of lots of shiny, new things under the tree. Christmas for these young adults has begun to make that shift that it does for all of us as we cease to be children. That shift is a real grieving, and I experience it still, myself. Do you? But, we adapt. We learn to create the happy settings once created for us by the parents and the grandparents. We embrace an expanding Santa Claus role as the joy of giving becomes as desirable as the joy of getting. We sit down and watch Hallmark Channel Christmas movies, forming new memories together and enjoying the sweet messages of the season. We attend beautiful, meaningful church services together as adults. If you already have thoughts about a “same, old” Christmas coming around again on the calendar, and if you think people are talking about it “too early,” consider that “same, old” is not such a bad thing here. Christmas is the same as it ever was for us in our lifetimes because God the Father is the same and Jesus the Christ is the same. Wrappings and trappings – be they fun, fluffy, or stressful – when cast aside, they reveal a message of Christmas that is the same as it always has been: Love. Forgiveness. Redemption. Emmanuel. As for old, Christmas was launched approximately 2,015 years ago, but, conceptually, it’s as old as sin. Wishing you a same, old Christmas that delights you in different, new ways as you plan, ponder, worship, give, and receive.